Many people regard the subject of homicide with horrified fascination. The apprehension, trial and sentencing of those who have killed is a conspicuous subject of interest to the community at large. Such cases are often portrayed as stories of ultimate deviance, horror and violence. However, regardless of the sometimes sensational facts, homicide cases raise some of the most fundamental and intractable questions in sentencing theory. Such issues must be resolved in practice by sentencing judges who apply great skill in the exercise of their discretion. Due to the public’s apparent insatiable craving for retribution, often fueled by inaccurate or incomplete media reporting, the sentencing of homicide offenders is susceptible to sometimes ignorant and “knee-jerk” criticism. Indeed, the capacity of the criminal justice system to “do justice” is often incorrectly measured by public reaction to the outcome of high profile cases. It is appropriate, then, that the present study analyses homicide from the perspective of sentencing outcomes and complements previous criminological research, which has typically focused on the incidence of violent deaths. In particular, this study distinguishes between the sentencing of those convicted of murder and manslaughter, analyses the use of partial defences and their impact on sentencing, and describes the features of specific types of homicides such as the killing of children and sexual partners. This project has been the major research focus of the Judicial Commission for the last two years and is the largest research project ever undertaken within the Commission. Hugh Donnelly, the designated project officer and Stephen Cumines, the project co-ordinator, were principally responsible for the successful transition of the project from its inception to completion. They also undertook the arduous tasks of data analysis and writing of this monograph, with assistance and advice from the other members of the Division. Ania Wilczynski, a research consultant whose expertise is in the field of child homicide research, was responsible for Chapter IV. Each chapter is self contained and provides its own conclusions. 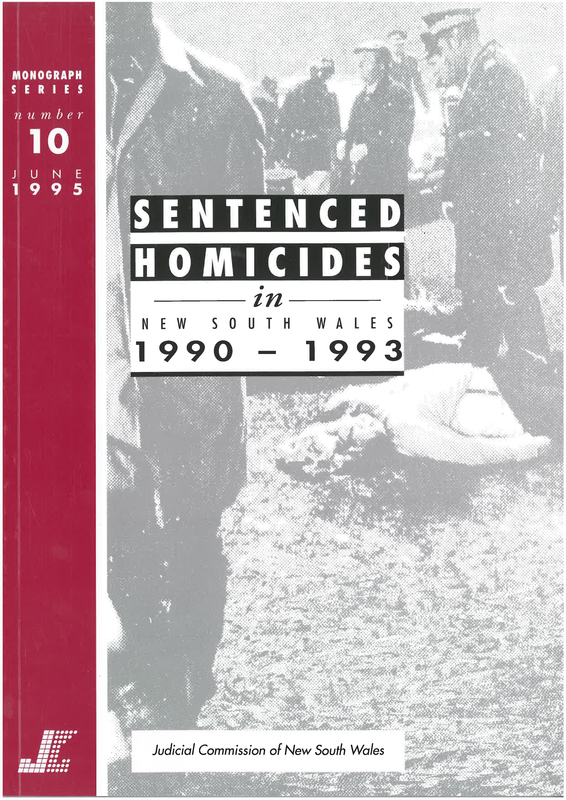 This report contributes to the continuing debate about the nature of homicide and the way in which courts deal with murder and manslaughter offenders. It will hopefully provide a firmer empirical basis for the consideration of issues of law reform. In addition, the development of a database of homicide sentencing cases will enable further monitoring of emerging sentencing patterns.